The number of college football All-America lists might just outnumber the reasons the BCS-bowl system is a crock, but it’s still an achievement anytime a service academy player’s name winds up on one. Air Force cornerback Reggie Rembert was named first-team All America by the American Football Coaches Association. Other names found on the first-team list include Auburn quarterback and Heisman Trophy shoe-in Cam Newton as well as Oregon running back LaMichael James, who leads the nation in rushing. Rembert led the Falcons with three interceptions this year. Not a gaudy statistic, but considering how rarely quarterbacks chose to throw to his side of the field, it’s not bad. Rembert is the first Air Force player to earn an All-America distinction since 1992 when another cornerback, Carlton McDonald, was honored. 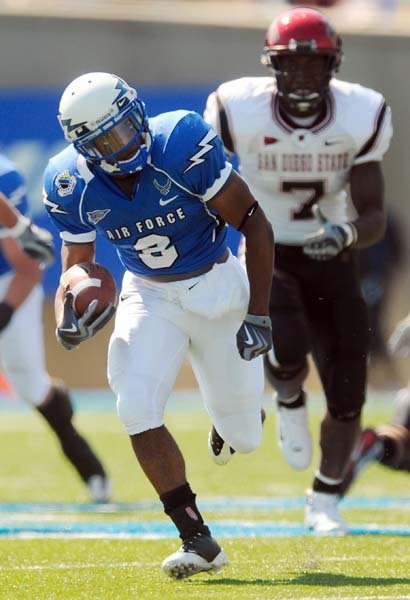 Former Air Force running back and current Philadelphia Eagle Chad Hall earned third team honors in 2007 on Rivals.com’s All-America team. The Falcon cornerback was a first team All-Mountain West selection last year and a pre-season first team All-MWC selection this year. Upon graduation Rembert will get plenty of looks by NFL scouts who already have him on their radar screen.